In order to celebrate the release of their new Bibliotheca Fantastica anthology tomorrow, Dagan Books is having a special 3-for-2 eBook sale! So why am I sharing this cool deal? A couple of reasons! Dagan Books is a great independent publisher of “weird, wicked, beautiful, and brilliant books.” I respect the hell out of what Carrie and the rest of the Dagan staff do. Why wouldn’t you want to support them? Yeah, that’s right. You couldn’t think of a reason either. And more selfishly, my story “Jewel of Tahn-Vinh” is included in their IN SITU anthology. It just so happens to be one of the eBooks included in this 3-for-2 sale. FISH, edited by Carrie Cuinn & KV Taylor; Cover by Galen Dara. Science fiction and fantasy. Retold fairy tales and brand new myth. 33 original stories by some of today’s best new writers, exploring a theme which is both simple, and impossible to understand, all at once. This anthology of slippery, flashy, delicate, dangerous, and beautiful tales features work by Camille Alexa, M. Bennardo, Corinne Duyvis, Cate Gardner, Sam Fleming, Andrew S. Fuller, Claude Lalumière, Ken Liu, Cat Rambo, Alex Shvartsman, and many more. 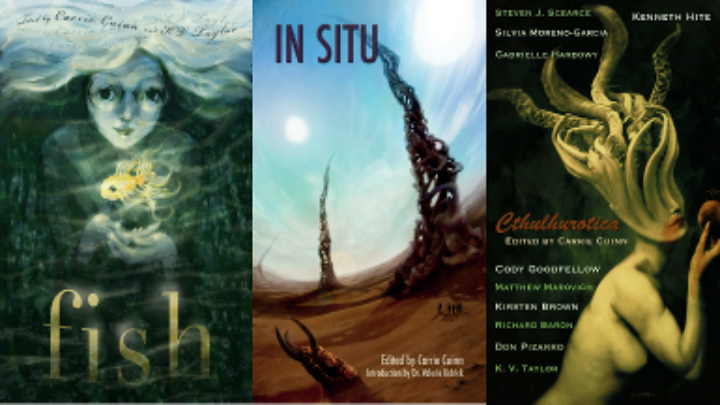 IN SITU, an anthology of science fiction tales about alien excavations, weird archeology, and the unearthing of mysteries. Edited by Carrie Cuinn, includes stories from Ken Liu, Paul A. Dixon, K. V. Taylor, Rebecca Lloyd, Bear Weiter, Mae Empson, and more. Cthulhurotica, an anthology of seductive and scary horror tales inspired by H.P. Lovecraft’s Cthulhu Mythos. Edited by Carrie Cuinn, published December 21, 2010. The revised edition contains more than 20 original works of art. Read more about our contributors here.